What seems like a worthy idea could unintentionally muddle mobility. Bills have been introduced in a few states that would create additional administrative pathways for the licensure of military and/or military spouses. The Uniform Accountancy Act and the laws of almost every state require for initial licensure 150 hours of education, one year of experience and passage of the Uniform CPA Examination: The problematic legislation being proposed would grant original licensure for any profession to any military personnel who have obtained relevant occupational specialties. 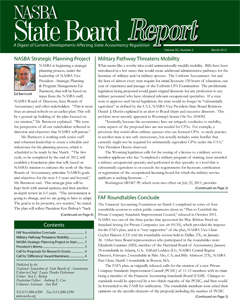 If a state were to approve such broad legislation, the state would no longer be “substantially equivalent” as defined by the UAA, NASBA Vice President-State Board Relations Daniel J. Dustin explained in an alert to Board chairs and executive directors. This problem most recently appeared in Wyoming’s Senate File No. SF0092. “Ironically, because the accountancy laws are uniquely conducive to mobility, some aspects of the proposed laws are not needed for CPAs. For example, a provision that would allow military spouses who are licensed CPAs to easily practice in another state is not only unnecessary, but actually includes some hurdles that currently might not be required for substantially equivalent CPAs under the UAA,” Vice President Dustin observed. Washington SB5307 99, which went into effect on July 22, 2011, provides that, “The department shall develop a process to evaluate military training and experience that may be applied toward meeting the training and education requirements of this chapter.” Indiana has a law pending that would require educational institutions to award credit for military courses that are part of military training. In Kansas, HB 2178 was passed that granted professional licenses to nonresident military spouses who are already licensed in another state; however, because of UAA mobility provisions, this does not impact CPA licensing. In February the U.S. Department of the Treasury and the U.S. Department of Defense released a 26-page report on “Supporting Our Military Families: Best Practices for Streamlining Occupational Licensing Across State Lines.” The report, which aims to give clear guidance on how to allow military spouses to resume licensed work without lowering standards or giving out preferential treatment, was unveiled by First Lady Michelle Obama, Jill Biden and Defense Secretary Leon Panetta on February 16. The Defense Department has been promoting this licensing issue since 2008, but according to the White House only 11 states have made license concessions and 13 others have proposed legislation that is awaiting action. Mrs. Obama said the goal is to have all 50 states pass legislation by 2014. She reported California, Louisiana, Illinois and Wyoming had introduced bills during February.